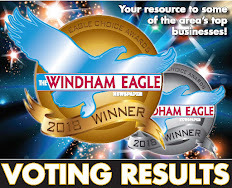 Windham’s Manchester School was nominated and awarded a $500 grant from ExxonMibil’s Educational Alliance Program to enhance math and science learning. On Tuesday, Sue Jones from Mr. Mike’s convenience store in Windham presented the check to assistant principal Danielle Donnini, Title 1 math teacher Danielle Burian and fifth grade teacher and science curriculum representative Tracey Butler. “It will really come in handy,” said Donnini. “It’s like Christmas presents for the math and science departments,” she added. The teachers started brainstorming all of the new materials they could buy. Manipulatives for math, owl pellets for science and white boards for students to use. Over 200 schools in New England received one of the grants. Since 2000, ExxonMobil has donated over $18 million to schools through the grant program. Manchester school was nominated by the former manager of Mr. Mike’s most likely because of its proximity to the school, said Jones. “We buy a lot of coffee up there,” said Donnini. 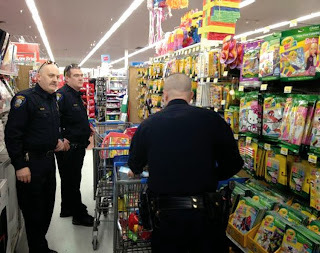 It makes people smile to see police officers in uniform shopping for toys. Not only did it make people smile, it had some digging in their pockets for cash to help at checkout time. On December 12, the executive board of the Windham Police Association union stopped by the North Windham Walmart to spend $1,000 that was raised through phone solicitations this past year. 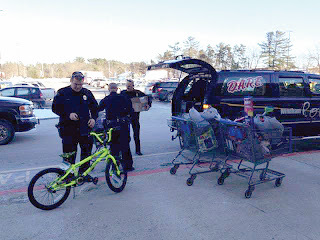 Officer and president Jason Burke, vice president and DARE officer Matt Cyr, secretary and officer Gene Gallant and officer and treasurer Jim Cook all went shopping with the mission to “get as many presents as we could,” said Cyr. They left with bicycles, board games, safety equipment, balls, matchboxes, dolls and iPod shuffles for older children, all to be donated to Windham’s social services program to give toys and gifts to children in need within the community. “As for the people that walked up to us in Walmart and handed us cash to help at the register, thank you. Your kindness was not unnoticed and will not be forgotten,” said Cyr. This is the second year in a row the department has done shopping for Christmas gifts. However, according to Cyr, there was a time in the not too distant past that it was an annual tradition. He hopes the project will continue every year going forward. Three local families will have a brighter holiday season thanks to the generosity of a local business owner. Jason Rickett, owner of JT Construction, LLC in Gorham, is helping to make Christmas a little bit merrier for these struggling families by donating gifts and oil to help get them through the winter. Rickett said that last year his company decided to help out a grandmother they’d heard of, who had recently adopted her two grandchildren right before Christmas and was unable to do much for the holiday. “It was just a good deed, and a good way to give back to the community,” he said. This year, the company decided to help out once again, and do a little more. A message was posted to their Facebook page asking if anyone knew of a local family that could use some assistance to make their holidays a little better. Rickett said they had many responses from that post, and narrowed it down to try and do the most they could for as many people as possible. That’s how they ended up with two Windham families in need of gift assistance. One is a single mother with two children, and the other is a two parent family with two children, where one parent is unable to work due to recent health issues. A third family in Gorham was having trouble keeping oil in their tank for the winter. Rickett is working with Pit Stop Fuel to provide oil for all three families. Pit Stop will match any fuel that Rickett purchases gallon for gallon. Being able to help other families feels great said Rickett. “My family is very fortunate for what we have, and the greater Portland community has helped me build what I have now,” he said. Helping others during the holidays is a way to give back and say thank you, he added. “It just feels good to be able to give others a Christmas that they wouldn’t have been able to have if we weren’t able to assist them,” he said. 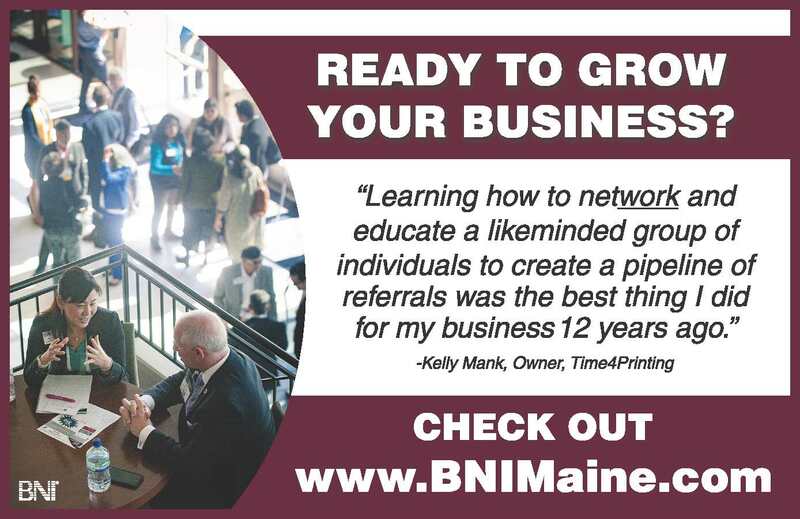 Rickett is a 2001 graduate of Windham High School. He said he has worked in construction since he was 16 years old, and started his company eight years ago. In those eight years, he said, he’s been able to build a successful company. JT Construction does mostly residential work, and can do anything from roofing, siding, additions, and remodels to building a house from the ground up, said Rickett. “We’re a smaller construction company, and we try and help out our customers as much as possible with keeping our prices down, which has helped us out a lot in staying busy,” he said. Rickett lives in Gorham with his wife and two children. 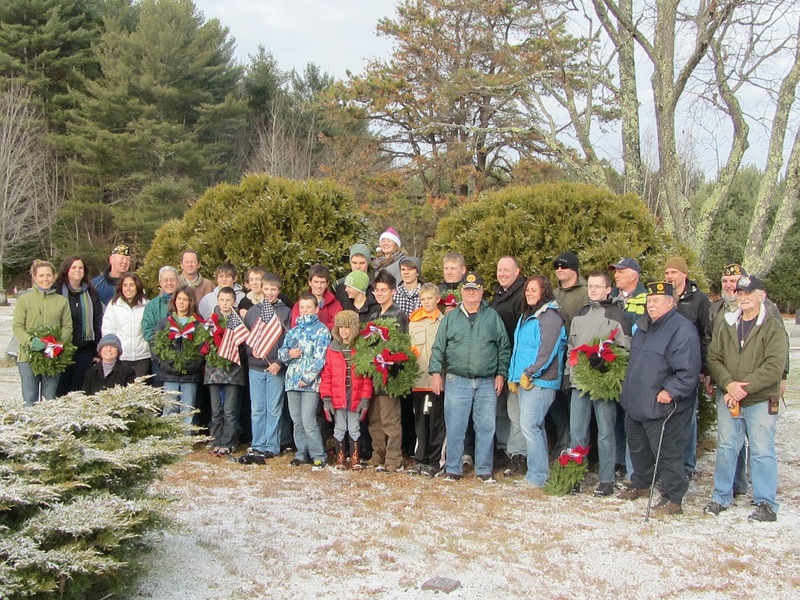 With a light covering of snow, volunteers from scout and veterans organizations joined together to lay wreaths at every grave of Windham’s veterans. 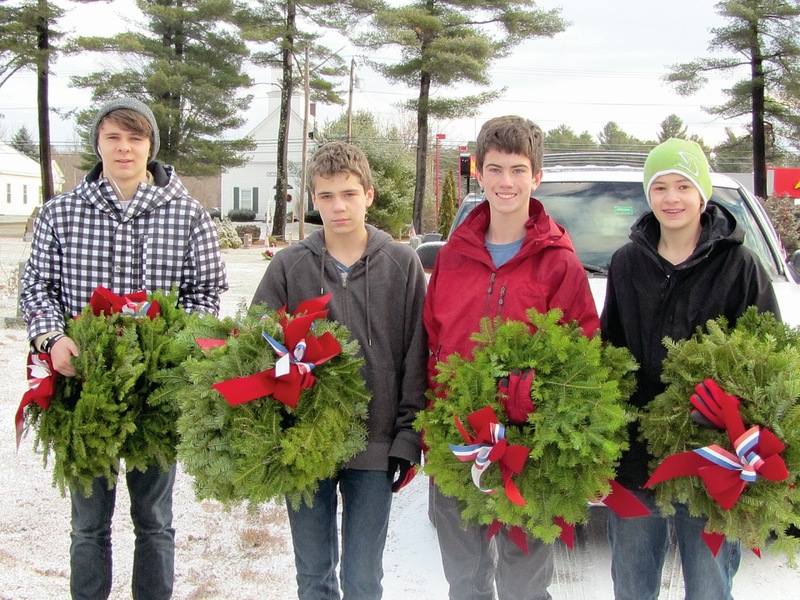 Scouts from Boy Scout troop 805 canvassed Arlington Cemetery next to the North Windham Fire Station, searching for placards, bronze stars or other items that denoted a veteran was laid to rest there. Each wreath with a red, white and blue bow was placed against the stone or flag holder. Boy Scout troop 51 worked at Chase Cemetery and Girl Scout troops worked at Smith and Mayberry Cemeteries. 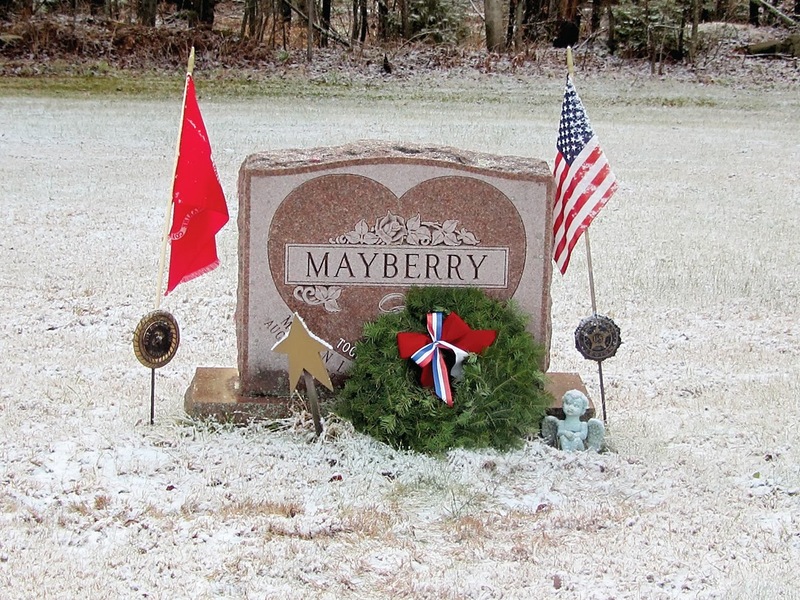 Libby Sawyer, owner of Studio Flora, had the idea to put wreaths on all of the veterans’ graves in Windham for the holiday season, an idea she based on the Wreaths Across America program that sends wreaths to Arlington National Cemetery to adorn those graves. 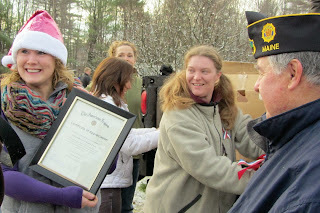 What she didn’t realize was that there were over 600 veterans whose graves were scattered all over Windham. Sawyer contacted Roger Timmons from the veteran’s organization in Windham to see if he could help. 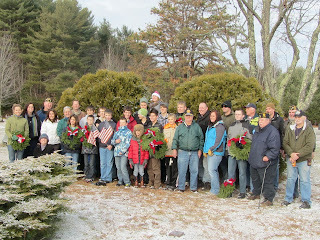 Dave Tanguay from the America Legion Post 148 took over and organized groups of Boy and Girl Scouts to place the wreaths at each of the larger cemeteries in Windham with help from veterans. It was a massive project, Tanguay said. “There are 30 cemeteries in Windham, 24 have veterans in them,” Tanguay said. He said that some are far off the road or might have only one or two veterans. Those are being placed by himself or another veteran. “Even the remote sites, we’ll still visit them,” he said. “Everyone should feel good about doing things in the community,” said Sawyer. “It’s 100 percent American. We want to make sure the next generation is understanding what these people gave,” she said. 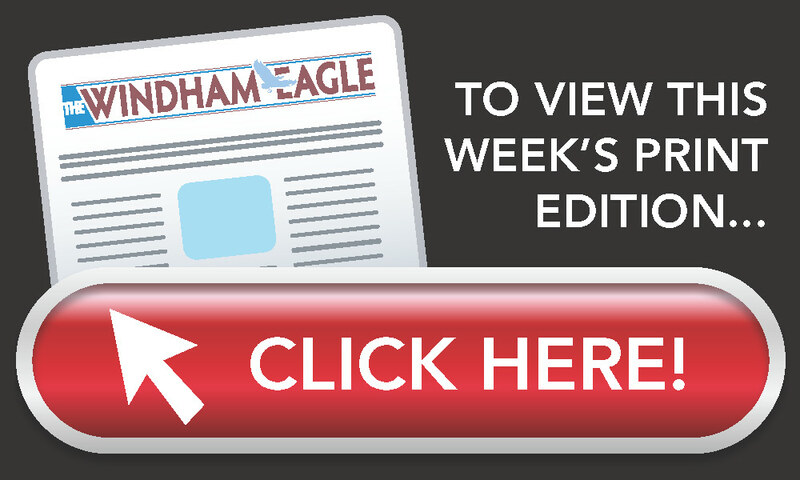 The project is expected to cost approximately $3,000, of which they have raised about $1,000, including a $500 check from the Windham Police Department. To donate or for information call 650-7484 or make checks out to American Legion Post 148. Sawyer hopes to make this an annual event and expand to Raymond as well. In a sold out concert, the Windham Chambers Singers brought in the holiday season with joyous music and some Christmas fun. 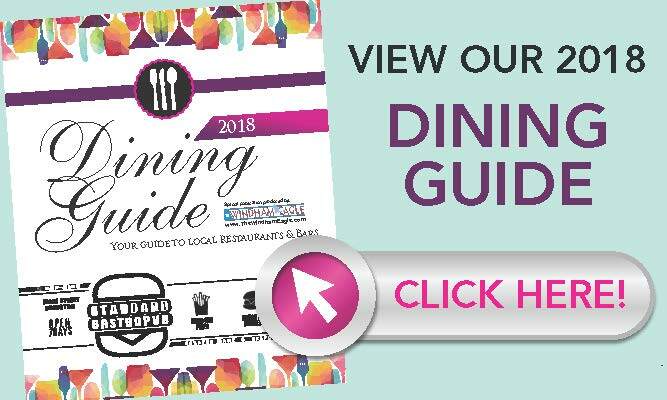 Guest stars were Tony-nominated Norm Lewis, who is known for his Broadway run in “The Gershwins’ Porgy and Bess” and now plays Senator Edison Davis on the ABC television show “Scandal”, and regulars Windham graduate pianist Daniel Strange and his talented violinist, wife Ashley Liberty. Channel 13s Kim Block acted as master-of-ceremony. The evening opened with the chamber singers performing “Puer Natus” on a darkened stage, lit only with Christmas lights. Ashley Liberty took the stage to play a few songs on her violin bringing many in the audience to tears with her beautiful interpretation of the music as her fingers flew over the strings. She also was accompanied by her husband, Dan Strange on the piano. Together they preformed “Lullaby”, a song they co-wrote for their 15-month-old son, Harrison. Strange called it some of the most honest work he has done. Strange also performed with the chamber singers as they sand “An American Family Holiday”, a song he wrote. Lauren Doering was the featured soloist from the chamber singers in the first half of the show. Norm Lewis entertained the packed house with “Before the Parade” a song he uses when he auditions, he told the audience. He had to make life choices, he said. He studied business in college and went into the advertising field. “I always had my foot in the musical theater,” he said. David and Sandra Daigle of Windham were given tickets to the concert as a gift. Although they hadn’t attended an Am Fam concert in a few years, they have followed the singers all along. “It’s always awesome,” David said. After intermission and costume changes, the chamber singers returned to the stage to sing two songs, one featuring Jennifer Bernier as a soloist. 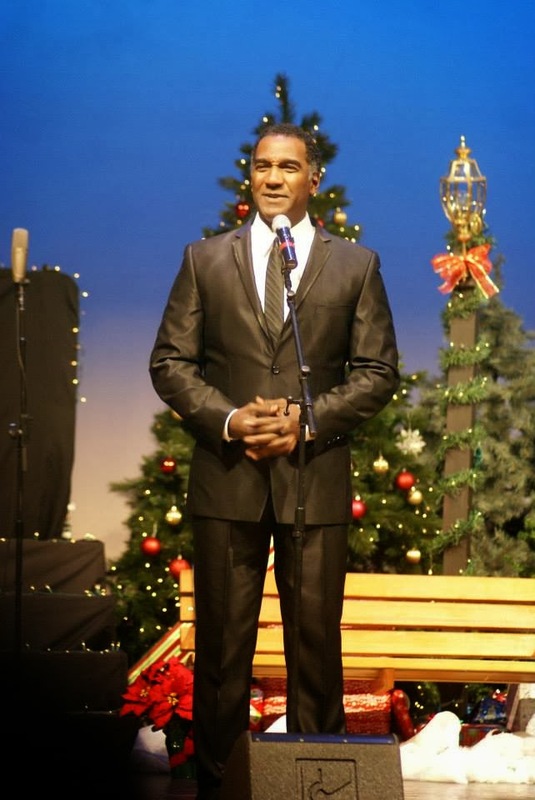 Norm Lewis made “Have Yourself a Merry Little Christmas” a crowd pleaser by leaving the stage and walking through the audience posing for pictures, talking to the “cheap seats” and making sure one photographer got his “good side” all the while never missing a beat. 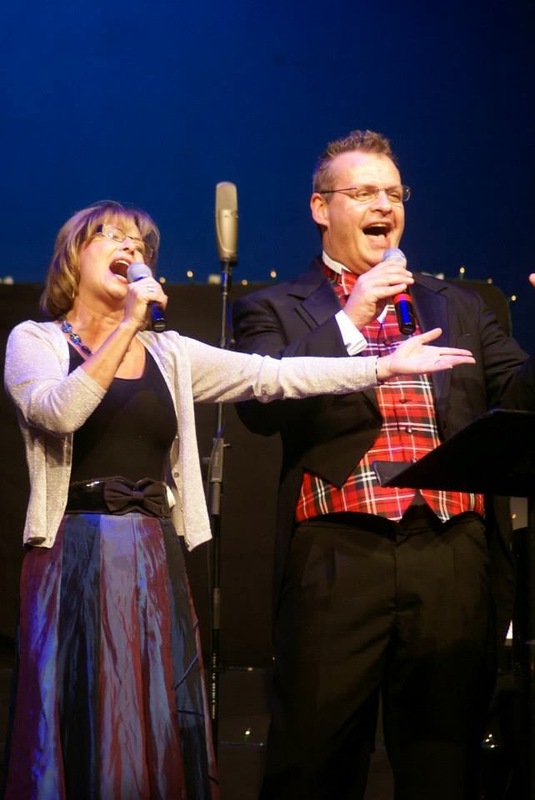 Kim Block was slated to read a children’s book, which she does every year, however, in a surprise move, Block and chamber singer director Richard Nickerson sang “We Need a Little Christmas” to the delighted crowd instead. One of the highlights of the evening was a rendition of “Santa Went Down to Georgia” with new lyrics and arrangement by Strange and Liberty. The song had the audience clapping and laughing along with the original lyrics. Strange and Liberty are working on a new CD of all original work together. There is no release information available at this time. They are also working on continuing to raise Harrison, Strange said. “I love (American Family Holiday). I look for it every year. It really gets you in the mood,” said Donna O’Brien of Westbrook. The concert has become Windham’s answer to the Magic of Christmas for the PSO. No holiday is complete without seeing the Windham Chamber Singers and guests. Watch for tickets for next year’s concert to go on sale, they are bound to sell out again.